Campaigning in New York, the senator from Vermont rallies with transport workers, pickets with striking phone workers, and tangles with corporate bosses. If media outlets paid even minimal attention to the struggles of working people, and to the organizations that represent them in those struggles, the last few days on the New York City campaign trail would have been recognized as a significant turning point in the 2016 presidential race: when a candidate for the Democratic presidential candidate backed striking workers so aggressively that he sparked a clash with some of the nation’s most powerful corporate CEOs. 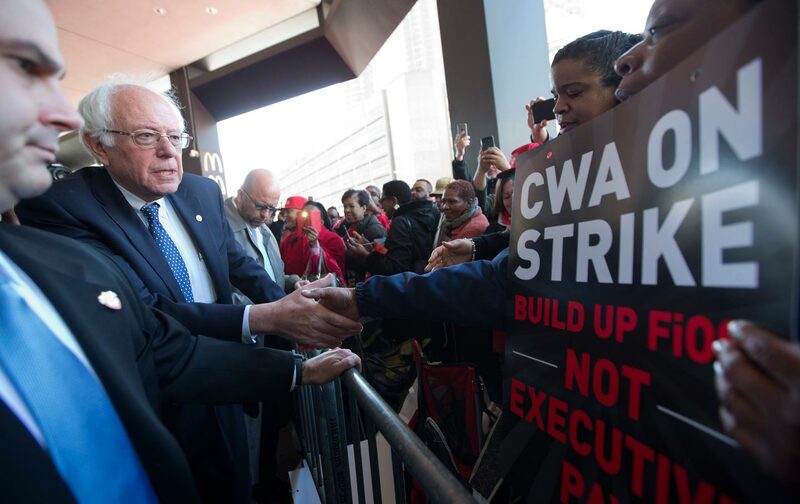 Sanders has been endorsed by the Communications Workers of America, one of the unions representing the 39,000 Verizon landline and cable employees who walked off the job on Wednesday in a critical fight to ensure that workers get a fair share in the digital economy. Sanders’s rival for the Democratic nomination, former secretary of state Hillary Clinton, has received a number of important union endorsements, including those of the National Education Association, the American Federation of Teachers, the Service Employees International Union, and, just this week, Local 3 International Brotherhood of Electrical Workers in New York. On Wednesday, Clinton showed support for the Verizon strikers and her campaign issued a statement in which Clinton said she was “disappointed” that negotiations between Verizon and its unions had broken down. But it is the aggressiveness with which Sanders defended worker rights while on the campaign trail that attracted attention—not just from workers but from corporate CEOs.